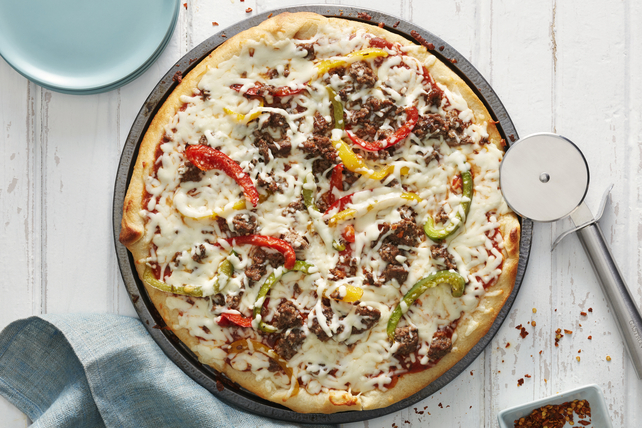 Mozzarella cheese, ground beef and sweet peppers top pizza sauce on a ready-to use crust to make this easy cheesy pizza. You'll be surprised where the secret flavour comes from. Brown meat in large skillet sprayed with cooking spray. Stir in 2 Tbsp. dressing; simmer 5 min., stirring occasionally. Spoon meat mixture into bowl; set aside. Add peppers and remaining dressing to skillet; cook and stir 5 min. or until peppers are crisp-tender. Remove from heat. Unroll pizza dough onto 12-inch pizza pan sprayed with cooking spray; press dough to evenly cover bottom of pan, stretching dough if necessary to fit. Bake 8 min. Spread crust with pizza sauce; top with meat, peppers and cheese. Bake 10 to 12 min. or until cheese is melted and edge of crust is golden brown.